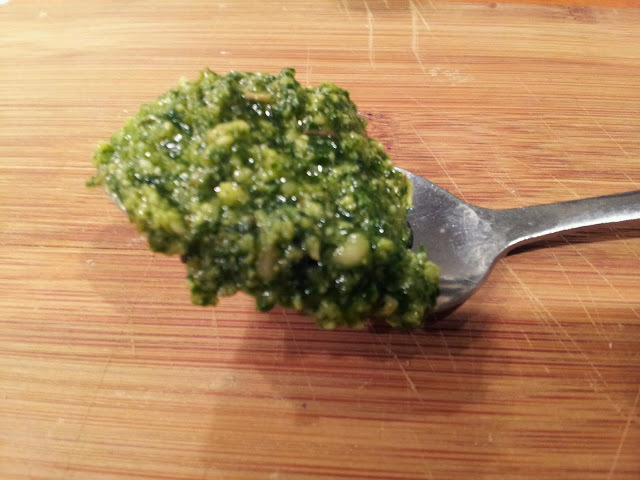 My basil plant was full of leaves, and I had some spinach in the fridge, so another pesto recipe seemed like the perfect way to use them up! Pesto is a great way to add flavour without adding any sugar (unlike using marinara, pizza sauce or barbecue sauce), and it provides a serving of heart healthy monounsaturated fats from olive oil. Place pine nuts in a pan over medium heat. Stirring frequently, toast until fragrant, about 5 minutes. Remove from heat and set aside. Place all ingredients in a food processor and blend until uniform, scraping sides of container as needed.